Today, the first of New York City’s public, gigabit wifi hotspots opened to the public. I tried them, so take it from me: They’re insanely fast. How fast? Fast enough that Starbucks’ free internet is about to get killed. 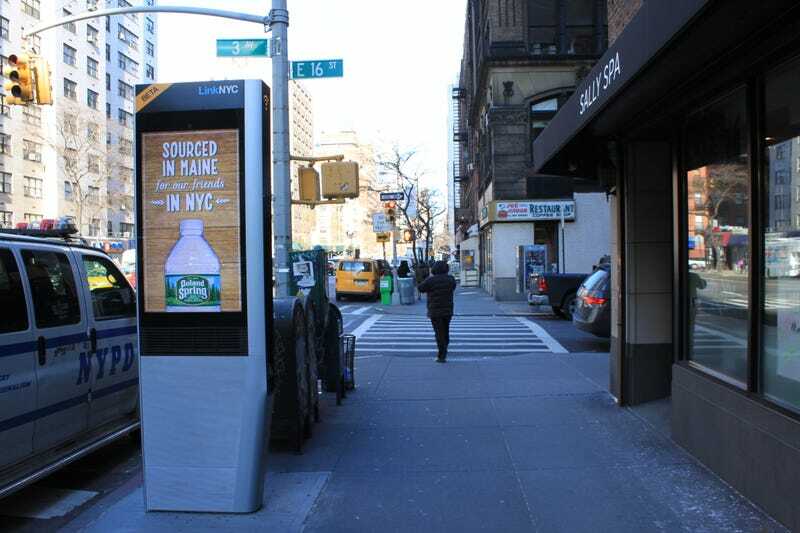 Earlier this month, we reported on LinkNYC, the Big Apple’s initiative to roll out breakneck internet access to everyone. Today, the first four modules are open in beta mode to the public. The 9.5-foot-tall rectangles, which are replacing the city’s pay phones, feature USB outlets for charging your devices (actual charger not included), city maps, 911 emergency access, and video calls to anywhere in the country. And, of course, wi-fi. Fast wi-fi. I ran internet speed tests at various locations this morning, with the goal of comparing a NYCLink location (at 15th Street and 3rd Avenue) to other common spots where I often score free wi-fi. Those included a Starbucks, a New York City subway platform that offers gratis wireless, and the Gawker Media offices. The winner? LinkNYC. It wasn’t even close. Like, at all. LinkNYC is ten times faster than New York’s existing public internet, and infinitely quicker than Starbucks. With city internet that fast, what’s going to happen to Starbucks, Barnes & Noble, Panera, or other establishments whose complementary wifi is such a pull? After all, if you want to work or study at a place that isn’t the library or your house, you pretty much have to buy a mocha and camp out. And with the sheer number of Links that New York is planning to install—7,500 units in the next 12 years, each with a service radius of up to 400 feet—it could mean that you and your devices will never be outside a serviceable zone. Still. These things aren’t designed to have people convene in front of them to stream Orange Is the New Black en masse. (Although the folks at LinkNYC have said the system can handle that.) They’re designed for temporary, fleeting experiences: checking your email, downloading a map of the city, making a quick Skype call. Whether LinkNYC will complicate the city’s relationship with chains and businesses remains to be seen. For now, the units are still being tested (911, calls, and maps aren’t yet available), and they seem to be advertisers more than anything, with signs hawking Coors Light and Citibank. You can use the wi-fi, of course—you just need to input an email address. (LinkNYC says that it will never give out private user information.) And in case you’re wondering, no sites are blocked from the network. Want to download some sleaze on a park bench? Go for it...I guess? For now, the city wants to open up ten new Links a day, with the goal of 500 running by July. Let the mass, ultra-fast streaming begin.